KUALA LUMPUR: Mutiara Goodyear Development Bhd plans to launch about RM1bil worth of projects next year despite the poor economic outlook, said chief executive officer Kee Cheng Teik. “Although the economic uncertainty has hit investors’ confidence level, there was demand for good projects with good locations especially in the Klang Valley and Penang,” he said after the company AGM yesterday. Kee said the company would be prudent to maintain a strong balance sheet. Mutiara had a net cash flow of about RM50mil as at July 31. Projects in Mutiara’s pipeline include a commercial block in Sunway in Petaling Jaya, a 69-acre housing scheme in Kajang and a 456-acre mixed development project in Penang. The company is also involved in the exclusive 80-acre freehold Nadayu property project near Taman Melawati in Kuala Lumpur, that will be launched by the first quarter of 2009. Kee, referring to talk that banks were limiting borrowings for property developers, assured that all of Mutiara’s projects had sufficient financing. “Our bankers have been very supportive of our projects,” he said. Mutiara was looking to increase its landbank, which currently stood at about 890 acres in the Klang Valley and Penang, Kee said. He added that the company was also exploring opportunities to develop properties overseas, especially in countries like Vietnam and China. ABU DHABI: Berjaya Hotels and Resorts is going all out to woo more Middle East travellers to its properties in Malaysia, including those located on Tioman and Redang islands as well as Langkawi. Its regional sales and marketing director, Peggy Tan, said Middle Eastern tourists are seasoned travellers, eyeing destinations where they could enjoy a total holiday experience. “We’re not only talking about, say, good hotels and accommodation and good airfares here. It has to be a total holiday experience for them. “And with properties on resort islands, the highlands of Berjaya Hills as well as in Kuala Lumpur, I think we should be able to meet their expectations,” she said on the sidelines of a workshop here yesterday, aimed at strengthening business ties with Middle East travel agencies and airline companies. 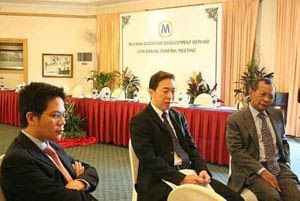 The event was part of a joint promotional roadshow with Tourism Malaysia, with Kuwait being the next stop. Tan said the company believes that the Middle East is the key to helping it further boost its presence in the international travel and leisure industry. She said Berjaya Hotels and Resorts had invested nearly RM66 million in product development and upgrading hotel facilities and would launch new rooms in Redang soon. In addition, she said, the company has appointed Dubai-based Leen Marketing Services as its general sales agent for the United Arab Emirates and the Gulf. “This office will be our eyes and ears that can hopefully spur more business from this region. “It’ll enable us to elevate Berjaya Hotels and Resorts’ branding and positioning in the Middle East market,” she said. A member of the Berjaya Corporation Group of Companies, Berjaya Hotels and Resorts is a public listed Malaysian conglomerate managing 15 properties in Malaysia, Singapore, Seychelles, Sri Lanka and the United Kingdom. Disclosing that Middle East customers chalked up close to 10,000 room nights at Berjaya hotels last year, she said Berjaya would offer more packages developed in collaboration with its travel trade partners. Being a Muslim country with wonderful culture and a wide array of culinary delights, Tan reckoned that Middle East travellers found Malaysia appealing. She also commended Tourism Malaysia for having undertaken numerous promotional campaigns in this region to attract more tourists to Malaysia. Tan said: “We’re committed to showcasing Malaysia as a premier holiday destination among Middle East travellers and are going into full gear with Tourism Malaysia in placing Malaysia prominently on the world map. Lucky workshop participants went home with attractive prizes, courtesy of Berjaya Hotels and Resorts and Tourism Malaysia. The number of shopping malls in Malaysia and their total gross area is expected to grow by some 20 per cent by the end of 2010, based on the current projects under development. This is similar to the 20 per cent growth experienced in the first half of 2008 compared with the same period in 2006, where total number of shopping complexes reached 260 and total gross area was 144.6 million sq ft.
Net lettable area now stands at 82 million sq ft. Mall development is expected to not only happen in city centres, but also suburban or small towns. This was revealed by the Malaysian Association for Shopping and Highrise Complex Management (PPK), whose president Joyce Yap said in comparison to other countries in the region, the retail space per capita in Malaysia is still low. This provides an opportunity for further addition. She was speaking at a press conference following the launch of the Council of Asian Shopping Centres Conference 2008 in Petaling Jaya yesterday. Meanwhile, Yap said local mall operators and retail tenants are still doing well amid the current global financial crisis. "Tenants are still (doing) okay. There has been no impact on their sales turnover and visitation," she said. However, she added that if the situation warrants it, rentals may increase by a smaller percentage compared with previous years when tenancies are up for review. PPK adviser Datuk Teo Chiang Kok said in the last three years, rentals in shopping malls have increased by up to 15 per cent, depending on the trade and location.